The Feast of Corpus Christi (Latin for Body of Christ), also known as Corpus Domini, is a Latin Rite liturgical solemnity celebrating the tradition and belief in the body and blood of Jesus Christ and his Real Presence in the Eucharist. It is often celebrated on the Thursday after Trinity Sunday, or 60 days after Easter, with a Mass and procession. While Christian feasts still constitute most of the official holidays in Norway, they are observed in a mostly secular way. 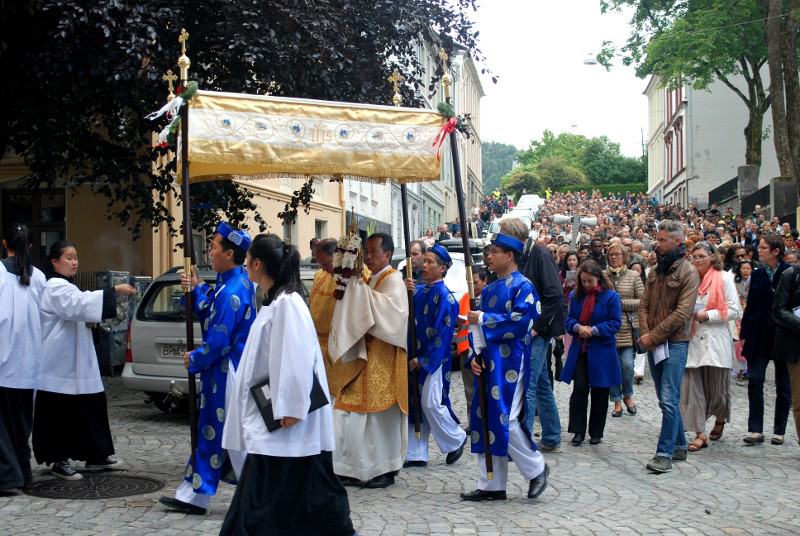 But Corpus Christi, celebrated in the streets of Bergen, sets Catholics apart.